The Perth Mint’s Discover Australia coin program is inspired by Australia’s rich landscape and unique wildlife. The program includes silver, gold, and platinum coins struck in proof quality with limited mintages. For 2012, the silver and gold coins have already been released, with the platinum coins scheduled for release on June 4, 2012. The silver coin series was officially launched in February during the World Money Fair in Berlin. The five animals featured are the Green and Gold Bell Frog, Goanna, Kookaburra, Whale Shark, and Red Kangaroo, which are depicted against a colored background. Each of the five 1 oz .999 fine silver coins are limited to a mintage of 7,500 worldwide and available either individually or within a five coin set. These meticulously crafted collectables have proven to be popular with collectors. The Perth Mint has indicated that just over 60% of the entire mintage has been sold within the first three months of offering, accounting for close to 23,000 ounces of pure silver. 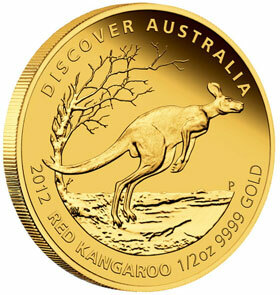 The gold coin series for 2012 was first released in March. The same five animals are featured in different designs and available in 1/2 oz, 1/10 oz, and 1/25 oz sizes, either individually or within five-coin sets. Each coin is struck in .9999 pure gold to proof quality. Through mid-May, some 24% of the total mintage of 1/2 oz gold coins (500 of each design), 16% of the total mintage of 1/10 oz coins (1,000 of each design), and 12% of the 1/25 oz coins (2,500 of each design) have already been sold. Altogether this accounts for more than 441 ounces of pure gold. 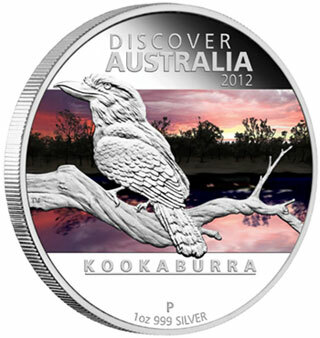 The platinum coins for the 2012 Discover Australia Program are scheduled for release on June 4, 2012. Additional information will be provided closer to the release date. For now, the Perth Mint has confirmed that these platinum issues will feature the same fauna as the gold and silver releases, but the colored designs will be different. Only 1,000 of the 1/10 oz. coins will be released for each design. For additional information or to place orders, please visit the Perth Mint’s website.